Somehow the grainy nature of the photographs perfectly capture what I imagine the light was like in the unused greenhouse. then it might follow that the sublime is that mode of the fantastic that generates a certain terror: that something is wrong, something’s not right, this doesn’t compute, something is off, off-kilter, beyond one’s ability comprehend. 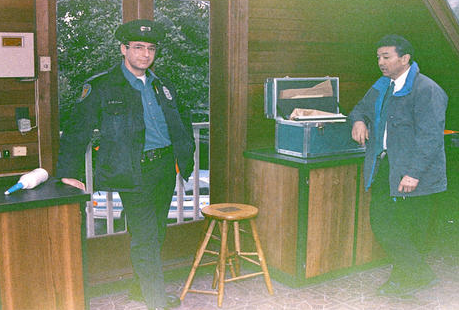 Recently the Seattle police released “dozens” of photographs of the scene of Kurt Cobain’s suicide. Traditionally I have ignored the myriad and intermittent stories about Cobain’s death, and it’s only recently that I’ve begun to understand why. Ironically, this realization took place, in part, due to my viewing of said photographs. There is something else, however, about these photographs on which I’d like to comment. While perusing them, an object – an artifact – of a seemingly inconsequential nature, jumped out at me: a “nightmare” thing**, a monstrosity hidden in plain sight, whose presence and presentation evoke what I can only think to call sublime. 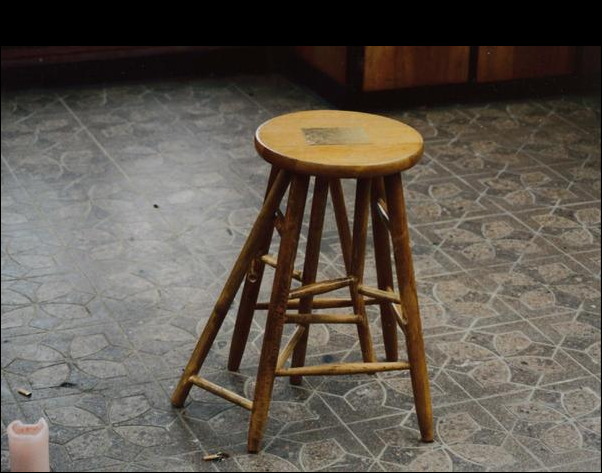 Of the set of thirty-one photographs, placed almost directly in the middle – photo number fifteen – is a closeup of a stool. It only appears one other time, in photograph thirteen, framed between a police officer and what looks to be a coroner of some sorts, and this – literally – simply as part of the (apparently lone piece) furniture. Two photos later, as though the photographer were struck with a similar fascination, we get a closeup. The stool, framed by the feet of the police officer and the end of a cabinet, and backgrounded by a closed set of french doors, features an extreme overabundance of legs and braces- so much so that it is impossible to isolate which legs are load-bearing and which are superfluous. Like a mobius strip or an optical illusion, it suggests and seems to exhibit a tight and well-crafted bundle of impossibilities. This impossible manifestation of overdetermination, however, is not the killing blow of its presentation: it is the suggestion of the question that seems caught there, on the surface with the flash from the film-camera image: Why? All the “why’s:” Why is it there? Why did someone make that? Why does it take it’s place in this particular room, posing, as it were, with the officials before the prostrate body of a suicided rock and roll legend? The photos – a mix of polaroids and 35mm snapshots – exhibit the hazy quality that you’d expect from a 20-year-old roll of undeveloped film, but also the oneiric atmosphere of the empty greenhouse above the garage that sat adjacent to the large home that Courtney Love and Kurt Cobain had not owned long, and who had hardly had a chance to live in. I can’t tell if it feels like some sort of collective memory or a dream – none of us, after all, where there. The light seems to catch in the middle of the air, like certain Instagram filters that provide the reflection of a physically non-existent photograph, smeared across a non-existent surface somewhere between the camera and the objects in the room. Kurt’s things lie in the sort of pile people make of their things when they don’t have many things, when everything becomes important. His arm looks like the arm of someone I’m familiar with, someone I know; and the box of shotgun shells in a paper bag and the french doors left ajar populate the scene with an eerie normalcy. But it is the stool that jumps out at me, that places itself just so, that pops up mid-stream as I browse the collection of photographs and whose presence, once noticed, grows to pervade the objects in the room – both within and without the frame. It feels as though the whole set of photos now exists to present, with a wink and a nudge, this terrible secret thing, as in a movie scene where a hostage-taker and his hostage are confronted by a friend of the hostage, who doesn’t realize what’s going on: the hostage, ordered by the hostage-taker to ‘act normal,’ yet does what she can to indicate that she is being held hostage: raised eyebrows, key-words hyperbolically emphasized, wide-eyed eye points in the direction of the shoddily concealed gun, etc., but to no avail. A quick google search confirmed my fears: no one, except a lone conspiracy theorist, for whom the stool played an important role in proving something (nowhere, in his account- or the police reports he cites, for that matter – is the profoundly terrifying nature of the stool note or discussed), has seemed to notice it. It was at this point that my desire to see the stool, to touch it, to sit on it, to find out who made it and why and why they made it that way, was born. 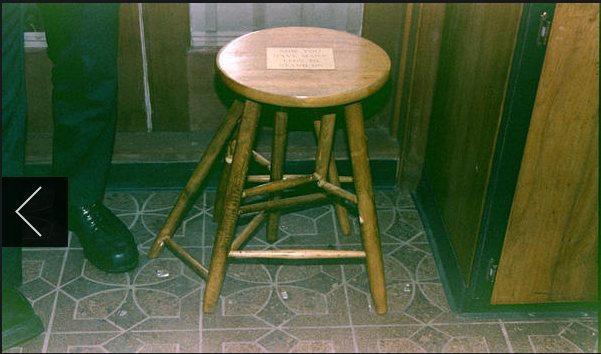 Like many others who have made the pilgrimage or thought about it before, I was struck with the reality that I could drive up there to where this happened, that the stool was real and could be touched, if it still existed. A few more google-searches, however, and it became clear that the stool has probably been destroyed for almost two decades, as the greenhouse was demolished in 1998 by a couple of Microsoft executives who had bought the house and who very well might still live there. I wonder if they saved the stool? Also: there seems to be a small sign on the stool: I wonder what it says? …had an extra leg built onto is which protruded out from the side. It was a gag stool. That’s why Kurt bought it. Here, in the light of a less rainy Seattle day, and perhaps because of the immediate context in the former pictures and in the knowledge of its personal relation to Kurt – as a “gag” – things are seeming less sublime? Maybe now we have to think about Irony? The only chair in the room is a gag gift, and it tells you that its legs are for standing. * I’m quoting here from an unpublished rough-draft of my third-field statement for my oral examination. ** Quoted from a conversation with Mlle. Cherry.